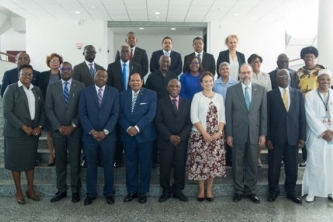 In Aruba representatives of Western Hemisphere countries, in particular from the Caribbean and from Central America , convened to develop a common approach to the phenomenon of the laundering of the proceeds of crime. Nineteen recommendations constituting this common approach were formulated. These recommendations, which have specific relevance to the region, are complementary to the additional forty recommendations of the Financial Action Task Force established by the Group of Seven at the 1989 Paris Summit. 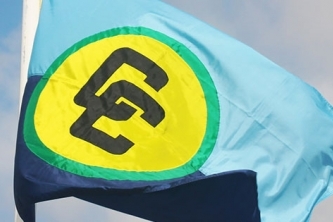 Currently, CFATF Members are Antigua & Barbuda, Anguilla, Aruba, The Bahamas, Barbados, Belize, Bermuda, The British Virgin Islands, The Cayman Islands, Curacao, Dominica, Dominican Republic, El Salvador, Grenada, Guatemala, Guyana, Republic of Haiti, Jamaica, Montserrat, St. Kitts & Nevis, St. Lucia , St. Maarten, St. Vincent & The Grenadines, Suriname, The Turks & Caicos Islands, Trinidad & Tobago, and Venezuela. Representatives of the Governments of Canada, France, The Kingdom of the Netherlands, The United Kingdom, and The United States of America (the "Cooperating and Supporting Nations"), meeting together in San Jose, Costa Rica, 9-10 October, 1996, considered the work of the Caribbean Financial Action Task Force (the "CFATF") since 1990, the benefits of effective implementation of mechanisms to prevent and control money laundering, and the need for expertise and training, and cooperation among Nations to assure such implementation in the Caribbean region. The Cooperating and Supporting Nations are members of the Financial Action Task Force on Money Laundering (the "FATF") and as such are committed to the 1988 UN Convention Against Illicit Traffic in Narcotic Drugs and Psychotropic Substances and to the implementation of the 40 FATF Recommendations concerning anti-money laundering measures. 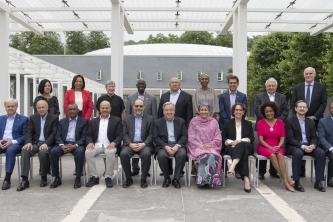 The Cooperating and Supporting Nations recognize the relationship between the work and objectives of the FATF and the work and objectives of the CFATF. 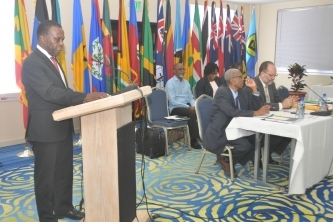 Accordingly, these Nations are committed to making such contributions to the work and/or resources of the CFATF as are permitted by their respective national laws and policies. At Council of Ministers Meetings in October 1999 and October 2000, both Spain and Mexico respectively joined the CFATF Group of Cooperating and Supporting Nations. • Self-assessment of the implementation of the recommendations. • An ongoing programme of Mutual evaluation of members. • Co-ordination of, and participation in, training and technical assistance programmes. • Biannual plenary meetings for technical representatives. • Annual Ministerial meetings . Money laundering is growing rapidly and subject to ever changing techniques. Since February 1996, the CFATF has been conducting a number of Typology Exercises on money laundering with the aim of increasing awareness of the attendant risks to the region. These exercises allow for the sharing of information collated by various bodies involved in combating money laundering. 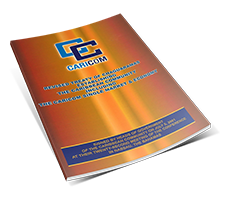 These exercises have explored money laundering activity in Domestic Financial Institutions; the Casino and the Gaming Industry; through International Financial Transactions conducted in both Domestic and Offshore Institutions and the Emerging Cyberspace Technologies. Given ongoing negotiations for the establishment of a Free Trade Area between the Caribbean and Central America and the objective of a Free Trade Area of the Americas by 2005, the CFATF in October 2000 conducted Part 1 of a Typology Exercise into the money laundering possibilities in the Free Trade Zones. Part 11 will be undertaken during March 2001. The goal of this particular initiative is the development of a Model Free Zone Compliance Programme and a Code of Conduct. As a first step, the Exercise led to the formulation of Money Laundering Prevention Guidelines or CFATF Member Governments, Free Trade Zone Authorities and Merchants. 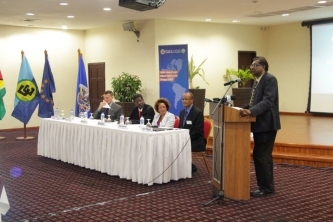 In April 2002, the CFATF and GAFISUD, the Financial Action Task Force of South America organized in Tobago , Trinidad & Tobago, a Joint Hemispheric Typology Exercise on Terrorism and Terrorist Financing. In furtherance of its mandate to identify and act as a clearing house for facilitating training and technical assistance needs of members, the Secretariat works closely with regional Mini-Dublin Groups, the diplomatic representatives of countries with interest in the region, in particular Canada, France, Mexico, The Netherlands, Spain, The United Kingdom, and The United States, and, finally, international organisations. 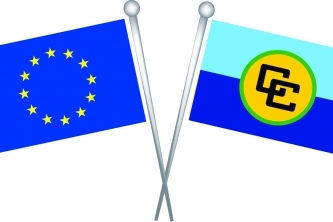 Included among these international organisations are OAS/CICAD, CARICOM, the Caribbean Customs Law Enforcement Council (CCLEC), the Caribbean Development Bank (CDB), APG Secretariat, The Commonwealth Secretariat, E.C./E.U., E.C.D.C.O., ECCB, FATF Secretariat, GAFISUD, GPML, IADB, INTERPOL, OGBS, Jersey, the United National International Drug Control Programme (UNDCP) and World Customs Organization (WCO). 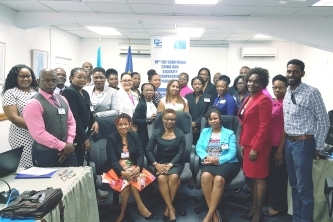 With the support of and in collaboration with UNDCP, the CFATF Secretariat developed a regional strategy for technical assistance and training to aid in the effective investigation and prosecution of money laundering and related asset forfeiture cases. The development of this regional strategy by UNDCP/CFATF parallels and is being closely co-ordinated with similar initiatives by the European Commission and efforts arising from the Summit of the Americas Ministerial in Buenos Aires . 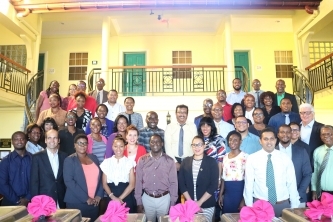 The CFATF Secretariat is hosted by the Government of Trinidad & Tobago. The CFATF Chair for the 2014-2015 period is The Honourable Luis Antonio Martinez Gonzalez, Attorney General of El Salvador. 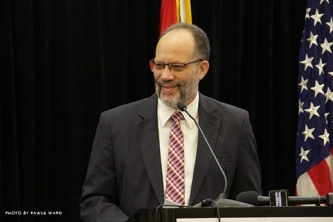 The CFATF Deputy Chair for the 2014-2014 period is Senator the Honourable Garvin Nicholas, Attorney General was elected to perform the duties of the Deputy Chair on behalf of Trinidad and Tobago. The Executive Director of the CFATF is Mr. Calvin E. J. Wilson.